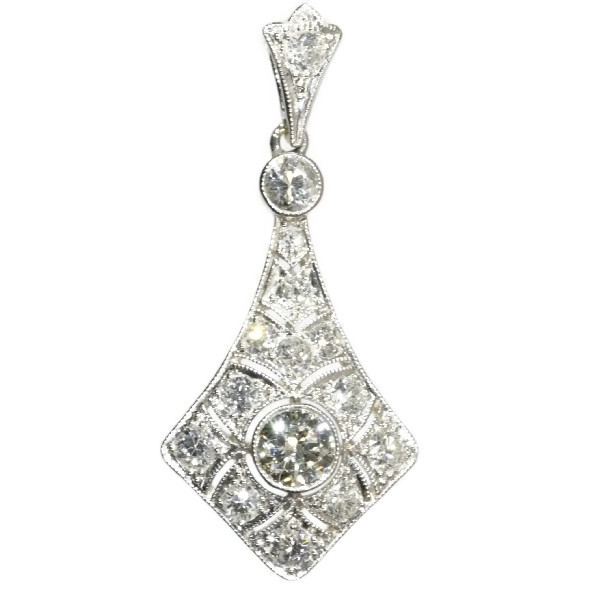 Platinum Art Deco diamond pendant: Description by Adin Antique Jewelry. This platinum Art Deco pendant from 1920 preserves in its elongated lozenge outline a four-leaf clover with an old European cut diamond as its heart. A repeating pattern of sheer luck expands degradingly upwards to another diamond. This joyful jewel encrusted with a total of 15 old European cut diamonds dangles from a suspension, which completes its sensation of bliss beautifully. Style: Art Deco - Art Deco is an eclectic artistic and design style which had its origins in Paris in the first decades of the 20th century. The style originated in the 1920s and continued to be employed until after World War II. The term "art deco" first saw wide use after an exhibition in 1966, referring to the 1925 Exposition Internationale des Arts Décoratifs et Industriels Modernes that was the culmination of high-end style modern in Paris. Led by the best designers in the decorative arts such as fashion, and interior design, Art Deco affected all areas of design throughout the 1920s and 1930s, including architecture and industrial design, as well as the visual arts such as painting, the graphic arts and film. At the time, this style was seen as elegant, glamorous, functional and modern. Style specifics: Abstract motives and geometrical forms are quite typical for the Art Deco period. Art Deco moved away from the soft pastels and organic forms of its style predecessor, Art Nouveau, and embraced influences from many different styles and movements of the early 20th century, including Neoclassical, Constructivism, Cubism, Modernism, and Futurism. Its popularity peaked in Europe during the Roaring Twenties and continued strongly in the United States through the 1930s. Although many design movements have political or philosophical roots or intentions, Art Deco was purely decorative. Total diamond weight: approx. 1.32 crt.